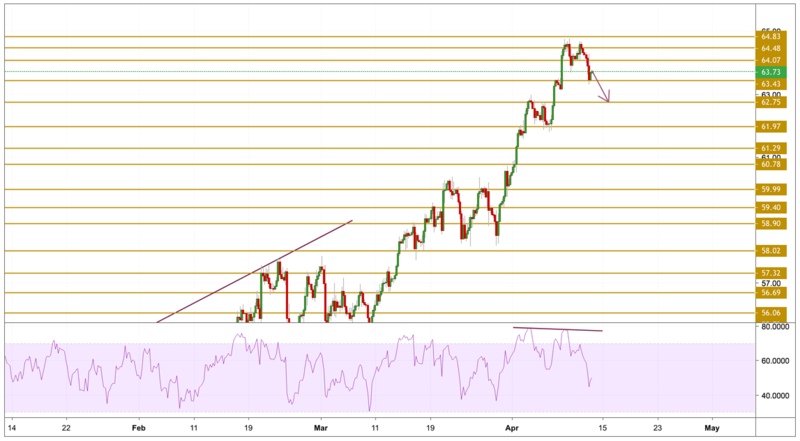 WTI finally cracked the key resistance-turned-support at $64 per barrel, as the sellers remain in command so far this morning. The sentiment remains weighed down by mounting concerns over the economic slowdown and surging US crude supplies. The recent downward revision to the 2019 global growth forecasts made by the IMF combined with the renewed US-EU trade worries, continue to cast doubt on the global economic growth and its impact on oil. These concerns outweigh the optimism derived from the ongoing OPEC supply cuts and the US sanctions on Iran and Venezuela that helped the prices reach five-month tops earlier this week. Crude oil went lower during yesterday's session after retreating from the overbought state as shown by the RSI (chart below). The divergence between the price and the momentum has finally showed its effect. The price is currently trading just below the $64 level after printing a low at $63.39 per barrel yesterday. The next key support level to watch is the $62.75 level and 20-period moving average.